Today Bethsoft announced on their website the release of The Elder Scrolls V: Skyrim Legendary Edition. On June 4th (or June 7th for European territories ), this new Skyrim release will be released on Xbox 360, PS3 as well as PC. This release will have the most recent up to date game version included (including the 1.9 title update) as well as all three DLC packs: Dawnguard, Hearthfire and Dragonborn. This may be an enticing deal to the few who have not bought Skyrim yet. The inclusion of the DLC really makes it worth buying since to buy all the DLC is about $45 and that doesn’t include the game itself. Most people like myself though, have already stood in line at midnight and bought the game as well as the DLC as it was coming out. 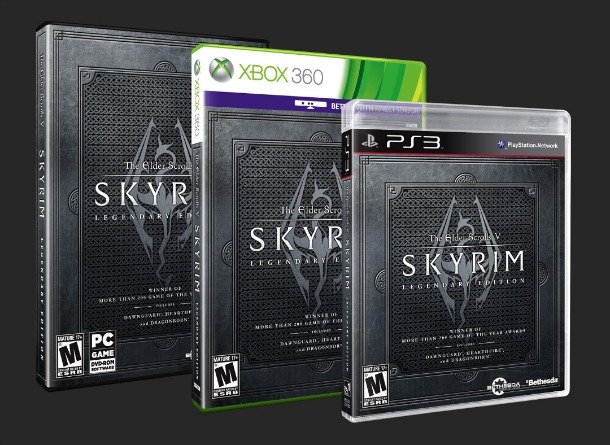 Personally, I think this release will get those last few resisting people to cave and finally purchase Skyrim. It may also be another tactic to keep the interest of the game alive and ever strong. I just hope there is not a resurgence of arrow to the knee jokes.